Held for the third time and staged as part of the annual IAGTO Awards, the Sustainability Awards were presented at a gala dinner attended by 1,400 golf tourism industry professionals at Siam Park, Tenerife, on the final night of the International Golf Travel Market. They were established as a result of a strategic partnership between the world’s golf tourism trade organisation, IAGTO (International Association of Golf Tour Operators), and GEO (Golf Environment Organization), and recognise excellence in the fields of environmental and social responsibility. For the 2016 Sustainability Awards, courses have been honoured across three regions: Europe, the Middle East and Africa; the Americas; and Asia. The awards ceremony also saw the launch of a new Sustainable Destinations Award for 2017, the winner of which will be announced at next year’s IGTM, to be held in Majorca. Jonathan Smith, GEO Chief Executive, said: “The entries to this year’s 2016 IAGTO Sustainability Awards have once again underlined the depth of exceptional action across nature enhancement, resource efficiency and community value which clubs across the world are taking, and the many benefits that these responsible businesses are receiving. The winners have shown an outstanding leadership in their commitment to sustainability and we congratulation them all. “We are also very pleased, along with IAGTO, to have launched the new Sustainable Destinations Award for 2017 and thank Hilton Head Island and the Algarve, as distinguished examples of sustainable destinations, for their support in doing so. 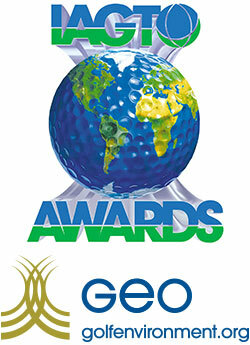 In its citation, GEO observed: “La Galiana wins the IAGTO Sustainability Award 2016 for the Europe, Middle East and Africa region due to their exceptional commitment throughout their operations and course and club management to the three pillars of sustainable golf: nature, resources and people. “Since opening in an abandoned orange plantation in 2011, the club has actively promoted the environmental recovery of the area and brought employment into the region. Some of the highlights from the club’s sustainability initiatives include a 15% reduction in water use and €20,000 saving on energy bills. This has been achieved through monitoring and adjusting irrigation methods, and reduction in the management of 3000m2 of out-of-play areas. GEO’s citation noted: “With its Championship Course located alongside 12,000 acres of nationally-important wetland, the PGA National has recognised the important role it has to play within this living landscape, along with its responsibilities to reduce its use of resources and enhance the benefits it can bring to its members, guests and the local community. GEO remarked: “Multiple environmental and social award winning Mission Hills Haikou is situated on a site that was designated a Global Low-Carbon Ecological Scenic Spot in 2013 by the Global Forum on Human Settlements and is constructed on permeable black lava rock. The club has not only acted on its responsibility to its unique local environment but also to the local community. The club has been a leader in China for fair wages and staff benefits and focuses on hiring local staff and providing continuous professional development opportunities. • For quotes from IAGTO Sustainability Awards winners and the overall 2016 IAGTO Awards press release, click on www.iagto.com/awards. The 2016 IAGTO Sustainability Awards were open to all GEO Certified® IAGTO member courses, of which there are more than 150. IAGTO is the global trade organisation for the golf tourism industry, comprising almost 2,400 accredited golf tour operators, golf resorts, hotels, golf courses, receptive operators, airlines, tourist boards, approved media and business partners in 98 countries. IAGTO operators control over 85% of golf holiday packages sold worldwide and their combined annual turnover exceed €2.1 billion each year.